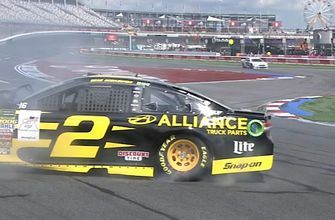 ANNOUNCER 1: The fastest car on the track tried to push it just a little bit too hard, and this is what happens. Coming out of 17, Brad Keselowski now climbing out of the car. ANNOUNCER 3: Just carrying too much speed. Couldn’t get the car turned back left, and you see the back end come around. And just no escape zone. Steve, you said it when we watched it live. This is the first time we’ve seen this wreck.